TDTM. 182. TAW. KPC. Do you have any idea what these popular texting terms mean? If you don’t, you’re way behind, but let me assure you – your kids aren’t. If they’re not using these terms, they’re at least privy to them. They may even be victims of these messages through cyber-bullying, a form of online ostracism that 88% of kids claim to have experienced personally. Bullying is real, and doing it online adds layers of anonymity, aggression, and group strength that empowers kids to be meaner than they ever would be face-to-face. 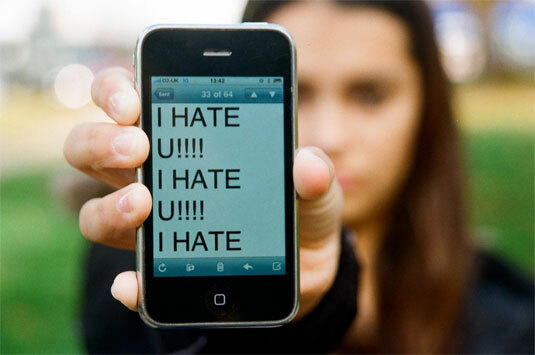 So what can parents do to protect their kids from cyber-bullying? 1. Ask your kids directly what they know about it. Asking an open-ended, non-confrontational question is much more likely to get an answer than either accusing your kids of taking part in it or expecting that your child has been a victim of it. Just say something like, “I’m hearing a lot about online bullying. Do you know anything about what’s going on?” and then sit back and let them talk. You’ll be surprised what they reveal. 2. Don’t interject, and be mindful of your reactions. Don’t respond with anger, transform into Mama or Papa Bear, and declare your mission to end all bullying forever. Just listen and learn. It’s okay to say, “That’s terrible. She must have been so hurt by that,” but keep your reactions calm and reasonable. Kids will not open up to you again if you overreact or jump into action. 3. Know what bullying is. In order for actions to be considered bullying, they must be repeated or repeatable, intentionally hurtful, and indicative of a power imbalance. One incident, however mean, is not bullying. Carelessly saying something that happens to hurt someone’s feelings is not bullying. Two kids trading barbs is not bullying. Before you involve school authorities, be sure that what you are hearing or seeing is truly an issue and not just a normal teenage spat. 4. Follow up. If you have legitimate cause for concern, take action. We’ve all read enough stories about bullying and its effects to know that it is serious and potentially life changing. Contact school personnel, take screen shots of poisonous words and threats, and make sure that your kids do not reciprocate or join in any type of bullying behavior. 5. Assure your children. Let them know that kids choose these methods of intimidation because they are insecure themselves. Tell your kids that bullies are weak and searching for strength by harming others. Remind your kids of their worth, their value, and their beauty. Encourage friendships with peers who build them up and support them. Provide a safe haven where your kids can open up to you, receive affection, and communicate their worries. And whatever you do, educate yourself. TDTM =Talk dirty to me. 182 = I hate you. TAW = Teachers are watching. KPC = Keep parents clueless. Don’t let your kids keep you clueless. Do the work to know what they are saying and what they are hearing. You can’t afford not to.